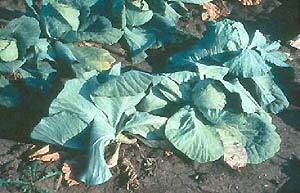 This fungal disease affects all cabbage family crops, and is present throughout most of North America. Plants wilt during the heat of the day and recover at night, older leaves yellow and drop, roots become swollen and distorted, plants are stunted and may eventually die. The fungus can live in soil for more than 10 years. Acid soil and warm, wet weather favor the disease. There is no way to cure infected plants. To protect crops, improve soil drainage, keep the soil pH above 7.2 (may be incompatible with other crops) and use at least a 7-year rotation between susceptible crops, if possible.